- Tachymeter scale around the rim of an analog watch, calculates speed on travel time or measure distance based on speed. - Requiem Shark series, Speedy Style. - Case diameter: 5.0cm approx. - Case thickness: 1.2cm approx. 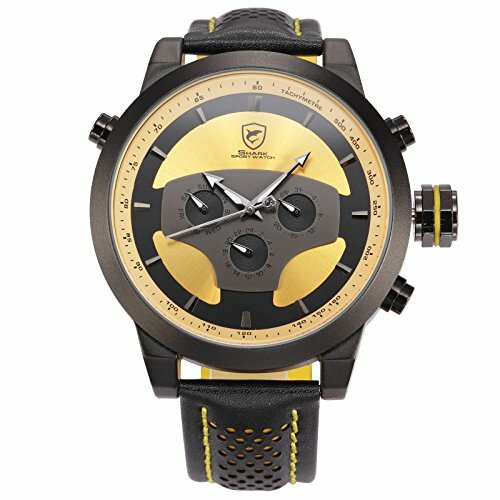 ★1.SPECIAL DESIGN:Requiem Shark series, Speedy Style.Designed by renowned Italian Watch Designer "Mr. Leonardo Cristiano". ★2.MULTI-FUNCTIONAL:DUAL Movement with the latest breakthrough Japan Quartz Technology.Enable with date, day, time Display function andWater resistant up to 3 ATM. ★3.MORE COMFORTABLE AND DURABLE:Genuine leather Band with stainless steel buckle,bring comfortable wearing experience. ★4.OCCASIONS:The watch is suitable for every occasion (casual, business, party, outdoor, indoor activities or daily use). ★5.IDEAL GIFT:A Fashion father`s day, Birthday, Christmas, Valentine day, Wedding, New Year Gift also a great present for good friends, boy friend, lover, husband, son, father, dad. If you have any questions about this product by Shark Sport Watch, contact us by completing and submitting the form below. If you are looking for a specif part number, please include it with your message.